Portfolio management is about allocating our resources to where they make the most difference to achieving our objectives, but of course this simple explanation hides a lot of complexity! One of the main things we do in the portfolio team is keep track of all the projects we’re currently running. This includes managing regular progress reporting to highlight and resolve issues that could otherwise hold up delivery. We maintain a portfolio wall where information on projects can be easily seen and run weekly stand-up meetings for the team to come together, share information and make key approvals decisions for our digital projects. 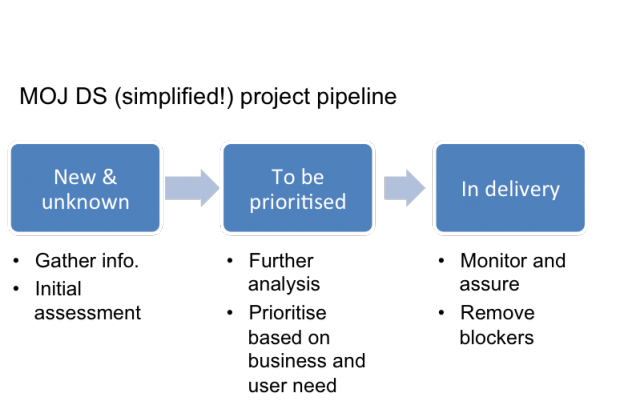 With a clear view of our current commitments we can then look at prioritising new work. We maintain a pipeline of potential future projects which is kept under regular review, and are the main point of contact for colleagues in the department and Government Digital Service looking at opportunities for new digital services at MOJ. The priority for us in the portfolio function at the moment is to work with our strategy team to make sure that new projects add up to help us deliver the Ministry of Justice Digital Strategy. As MOJ DS carries on growing we’re also working with the team to develop our project delivery framework so that it continues to support agile working while providing effective management information and control for our expanding portfolio.